Last time I helped out someone with ransomware over at the Bleeping Computer forums, I was able to recover the ransomed JPEG files. Neither did a look at the header with a hex editor tell me much more. The file has a high byte entropy: 7.815519, that's almost the maximum (8.0). So the file appears to be a set of random bytes, e.g. an encrypted file. But my program not only calculates the entropy for the whole file (along with other properties), but it also splits the file in buckets (10KB size by default) and calculates the entropy (and other properties) for each bucket. The second entropy value produced by the analysis (5.156678) is the lowest entropy calculated for the buckets (85 in total for this file). And an entropy of 5 is much lower than the entropy of encrypted or compressed data. So somewhere in this file there is data that doesn't look very random. Somewhere around position 0x5000, data doesn't look random. I took a look with my hex editor, and quickly recognized JPEG structures. What was missing were the first headers of a JPEG file. So I patched a file together with the header of a JPEG file followed by the data recovered from the ransomed file. And to my surprise, I had recovered the image. The entropy of this file looks uniformly high. 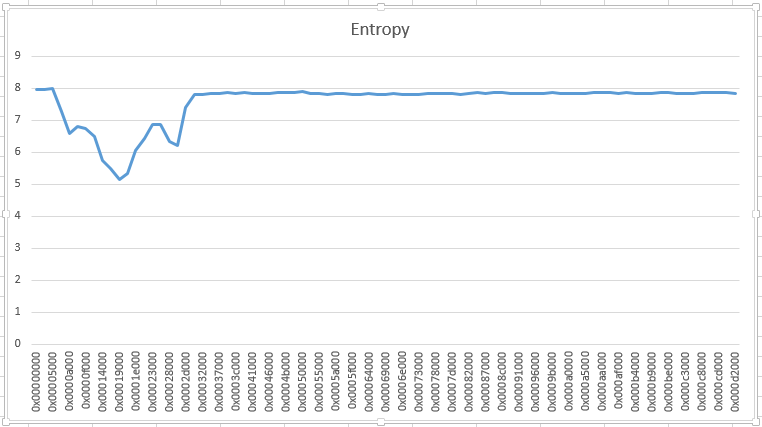 I often look at the entropy when I analyze files. Many of my analysis tools include entropy calculations. For example, pecheck.py provides the entropy of each section of a PE file, allowing me to quickly identify packed sections. Really nice article. Just had one query. How did you patch the different buckets having similar entropy value and JPEG header? And is is possible to do this for other types of files as well? So I just created a file: \xFF\xD8\xFF\xE0\x00\x10\x4A\x46\x49\x46\x00\x01\x01\x01\x00\x48\x00\x48\x00\x00 + JPEG data from the "encrypted" file. And this was a valid picture. It did only work for JPEG files, I did not recognize any structure in the ransomed .doc file. Great catch on the headers. One question though. In your recovery program, you look for hex string FF DB 00 C5 (content.find('\xFF\xDB\x00\xC5')). Why C5? Every jpg of mine I looked at, that string didn't appear. FF DB 00 43 did though. FF DB is the marker for the quantization tables, and 00 C5 is the length of the quantization tables. A quantization table is 0x40 bytes + 1. So that's a length of 00 43 (0x41 + 2). You have one quantization table in your pictures. The victim had 3 quantization tables in his pictures (3 * (0x40 + 1) + 2 = C5). When I used just the marker FF DB to search the ransomed files, I had false positives. So I decided to search for FF DB 00 C5, but the down side is that the program only works for the victim's pictures. So you've rebuilt first 16B of JPEG header [JFIF SOI+JFIF APP0 marker segment - according to JFIF structure] and then put image content after SOS marker [start of scan]? So it means that compressed image data [after SOS marker 0xFFDA] were untouched by ransomware? Or despite encryption of compressed image data, the jpeg image (after header reconstruction) was visually the same image? No, not starting with the image after SOS. Like I wrote in a previous comment: starting with the quantization table. What was lost was the EXIF data.